Preheat your oven on CircoTherm® at 160˚C. Beat the butter and sugar in a bowl with an electric mixer until creamy. Add the egg yolk and Golden syrup and beat until combined. Stir in the flour, ginger, mixed spice and bicarb. Turn onto a lightly floured surface and knead until smooth. Press gingerbread dough into a disc, cover with plastic wrap and place in the refrigerator for 30 minutes. Place the dough between 2 pieces of baking paper and roll out until 4mm thick. Use cookie cutters to cut out shapes making sure you leave 3cm between each shape (to allow for expansion during cooking). 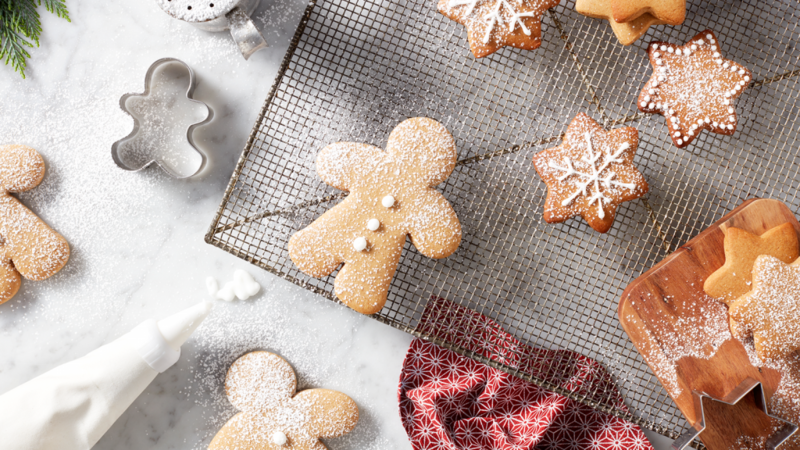 Lift away the excess dough and place baking paper with gingerbread shapes directly onto trays. Repeat with the excess dough until all used. Bake for 10 – 12 minutes or until brown. Larger shapes may need extra cooking time. Remove from oven and transfer onto a rack to cool. Beat the egg white with an electric mixer until soft peaks form. Gradually add icing sugar and beat until stiff peaks form. Placed prepared icing into a piping bag and decorate the gingerbread shapes.